Yet another prime candidate for craziest race of the century… Indeed the 1982 Monaco GP was the craziest of races in the craziest of seasons. And our man pictured here, Derek Daly, could have won it. But so could Didier Pironi. Or Andrea De Cesaris, for that matter. And what about Nigel Mansell or Elio De Angelis in the Lotuses? They all got tantalizingly close. Eventually, it was Riccardo Patrese who took it. After having lost it. Yes, it's that complicated! What's more, it was also the first race without having Gilles around. And the winning Brabham was the last DFV-powered Brabham to do so. In fact, it was one of the last occasions the atmo gang got one over the turbo mob (more on that later). In all, a true milestone Grand Prix, fought over in difficult circumstances. The F1 world was in disarray over the FISA/FOCA war, which indeed had turned the San Marino GP into a FIASCO. The previous seasons hadn't been happy ones, politics-wise, and since the advent of Mr Balestre as the head of the CSI (quickly rechristened FISA) relations between the ruling body and the FOCA had been strained. And that's putting it mildly. In February 1980 FISA immediately wanted to stamp its authority back onto the sport, issuing new regulations that would be in effect from 1981 onwards. Most striking elements of the new rules were upping the weight limit and the abolishment of ground effects. Those decisions - sorry, proposals - did not go down well with the FOCA teams, who claimed they weren't given the usual two-year fair warning. So during the 1980 and 1981 seasons many phyrric victories were scored next to the usual victory celebrations. First we had the Battle of Jarama, which was boycotted by the Great Constructors and afterwards declared a pirate race by the FISA. Jones won, but it was all for nothing. Then the same happened at the start of 1981, when the turbo teams did not show up at Kyalami. In the meantime, FOCA launched the idea of a rival F1 series under the World Federation of Motor Sport banner. If they had been able to organize pirate races, why not a pirate championship? But with the Maranello Agreement transforming into the Concorde Agreement by March 1981, that idea was soon deserted and Pax Concordis set in. Below the surface, however, the feud was still boiling. At the start of 1982 the heat was turned on once again. It had all started with the drivers walking out prior to the opening race of the season at Kyalami. Under the cunning guidance of the returning Niki Lauda they had left the track to a local hotel and started a sit-in that quickly emulated a sixties atmosphere: Gilles and Elio took turns on the piano, while Bruno Giacomelli started drawing cartoons and held a lecture on international terrorism (imagine that in these days!). The bone of contention was the newly introduced Super License arrangement, whereby the drivers had to adhere to a clause which obliged them to state their exclusive commitment to one team until a certain date. And then there was this clause requiring drivers to agree they would not do anything to harm the interests of the sport and the World Championship. Just the thought of that! After that, a fierce power struggle ensued between, well, just about everybody. Jean-Marie Balestre hated the guts of Bernie Ecclestone, the drivers hated the guts of Monsieur Super License, and Bernie hated the guts of the drivers. And so suddenly Balestre and Ecclestone found themselves in one camp opposite the drivers. At one point Balestre announced all Super Licenses - unsigned or not! - would be suspended and that no driver could ever again take part in a FISA-licensed event. Team managers were threatening to fire their drivers if they did not show up for practice. The situation was in a total deadlock. Then, unexpectedly, a deal was struck between GPDA president Pironi and the FISA and the race - which looked to be off for at least a week - was suddenly on again. And what a race it was. Within a couple of laps it became apparent you needed a turbo if you were to stand any chance of winning. The FOCA teams didn't like it one bit. Old wounds were ripped open. And then a few kilos of salt were poured into them as Nelson Piquet and Keke Rosberg were disqualified from first and second at the Brazilian GP. The ruling body claimed they had contravened the weight limit rule in an unsportsmanlike ploy: after the race, both Williams and Brabham had topped up their "water-cooled brakes" reservoirs on their respective vehicles, allowing them to pass post-race scrutineering. After the ruling of the FISA tribunal was held up under appeal the paddock returned to the state of affairs of the past few years. The British teams (read the very gentlemanly behaving DFV-powered squads) couldn't stand the sight of those from the Continent (read those spaghetti and onion eating turbo teams), while the traditional FISA-backed Great Constructors (read the glorious Ferrari, Alfa and Renault equipes) looked down on FOCA's kit-car assemblers (read those predominantly British hand-to-mouth garagistes) that had changed the face of F1 since, let's be frank about it, 1959. But in this case they had been pushing their luck. With the FOCA teams stating that the rules did not specifically forbid the topping up of lubricant and coolant, they had a defense which was just as legal as Ferrari's case on their 1999 Malaysia fiasco. Still, the verdict had angered them enormously as they felt they were being treated like ugly little ducks. And so the ducks stayed away from Imola. Although the FOCA teams agreed to turn up at Zolder with ballasted cars, Imola and the Belgian GP would be remembered for the sad internal battle at Ferrari leading to Villeneuve's fatal accident. So when the F1 circus rolled into Monaco, everyone tried to create an atmosphere of laissez faire for themselves, preferring not to look back at the past weeks' events. Gilles' death had certainly left an impression. Qualifying was frantic as the cars skidded across the track in their efforts to claim one of the mere 20 spots on the starting grid. The car on pole wasn't a surprise - a Renault yet again - although in some ways it was unexpected to see Arnoux deal with turbo lag so swiftly on a track which for once seemed well suited to the DFV gang. Still, the turbo cars of Giacomelli and Prost swamped the second row, with only Riccardo Patrese in his trusty Cosworth-powered BT49D interfering with the turbo party at the front. Riccardo lined up alongside René, while team mate champion Piquet was out to prove his BMW engine was an underdeveloped turbo with a very tiny power range. Then again, his occupying 13th slot on the grid could well have more to do with Nelson's dislike of the track. Until about 10 laps from the end the 1982 Monaco GP looked like a normal race for a change. Sure, we had seen a lead change after Arnoux hit the barriers on lap 15, but nothing spectacular happened as Prost was leading the race for ages since Arnoux's demise. He looked a strong bet for a win and an extension to his championship lead. The race also took its toll on others as the usual Monaco attition rate claimed victims such as Giacomelli, Laffite, Watson, Piquet, Lauda and Rosberg. Then, with a just a handful laps to go, a light drizzle set in and the track started to get slippery. Patrese and Pironi started to close on Prost while Michele Alboreto gave away a fine fifth by clobbering the barriers. The drizzle now turned into rain as the skies darkened above the Principality. Within moments, Derek Daly, who was in only his second race for Williams, having replaced Andretti who in turn had replaced Reutemann, slammed into the Tabac armco head-on, the impact turning his car around, leading to yet more devastating contact with the barriers. The Irishman had lost his rear wing and one of his front winglets but to his surprise that was it. The wheels were all there, the steering column was in full working order and the engine was running. And so Derek took off again, dragging parts along like he just got married. Then our attention suddenly shifted to the chicane where we saw a hammered Renault three-wheeling left and right across the track. Prost was out with a bang! Now Riccardo Patrese took over in the lead. Crossing the line, he was on his last lap. But he also gave it away. As he slithered through Mirabeau the car caught him on the hop at the Station Hairpin. The BT49D ended up on the inside kerbs but then started to roll until the back end stuck out on the racing line. Riccardo's engine had stalled though, so there was nothing he could do while he watched Pironi tiptoe past to certain victory. By now, second place was in the hands of Andrea De Cesaris while the amazing Daly was back up into third! Everyone was looking frantically at their lap charts. Who was left? Daly? No, surely not Daly! Yes, it was ol' Irish Derek who should be taking the lead any moment now! Would the dream opportunity for the man who had started the season as an also-ran driving a Theodore, turn into a real dream? It became a dream alright but not one to cherish in reality, as Derek's battered FW08 finally succumbed to its ailings. Next! He had relegated the two Lotuses back to their lap behind and was the winner. Still unaware of the fact and sure to be disqualified for a push start he needed much convincing before raising his trophy. As for the man who nearly won a World Championship race using a moving scrapyard, Derek Daly never came close again. In fact, his season with Williams was to be his final year in F1, as he was thoroughly upstaged by Keke Rosberg's superb efforts. Daly then chose to embark on a new adventure in the United States. Yes please, Frank! That must have been Derek's reaction when Frank Williams asked him to step in for Carlos Reutemann after the Argentinian's sudden retirement after the Brazilian GP. Actually, Mario Andretti stepped in at Long Beach, they skipped San Marino due to the FOCA/FISA water-cooled brakes fiasco so Derek had his first Williams drive in Belgium (where the FW08 also made its debut). 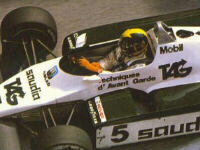 Monaco was thus the 2nd appearance both for the FW08 and Daly/Williams, and he very nearly won it! The race itself was quite extraordinary. Rene Arnoux's Renault led from pole until he spun and stalled on lap 15. His team-mate Prost then took over the lead with Patrese's Brabham challenging but tried too hard on a damp track and crashed on lap 73. Two laps later Patrese spun letting Pironi's Ferrari through, but he ran of of fuel with one lap to go. Derek Daly would then have won had he not damaged the rear end in a spin and de Cesaris's Alfa Romeo also ran out of fuel on the last but one lap, so Patrese ended up back in the lead on the final lap and was the only driver to complete the distance to take his first Grand Prix win. Born on 11th March 1953, Derek Daly was the most successful Irishman to race Formula 1. He started his career in stock cars at the age of 16 in 1969 before finally graduating to Formula Ford in 1974. He financed his 1975 season by working in Australian tin mines with David Kennedy and was rewarded by becoming the Irish Formula Ford champion. In 1976 he won the Formula Ford Festival at Brands Hatch (living out of a converted coach!) and then won the British BP Formula 3 crown in 1977. He then kicked off his Formula 1 career with the Hesketh team in 1978 by leading the very wet International Trophy at Silverstone until spinning off. His form in the World Championship was not so good and he failed to qualify in 3 attempts. 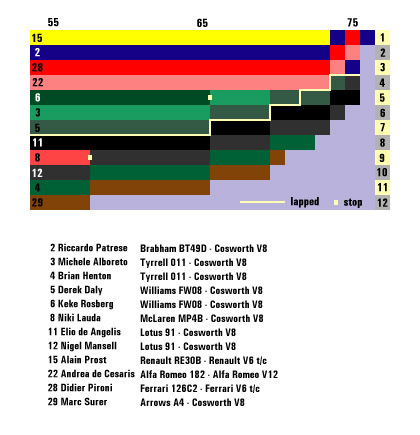 Crossing to the Ensign team was an improvement and he scored a point before the year was out, finishing 6th in Canada. After a poor start to the 1979 season in an increasingly uncompetitive Ensign, Derek stepped back to Formula 2 with the works March team. However he was soon back in Formula 1, taking Jean-Pierre Jarier's place at Tyrrell. This was followed by a full season for Tyrrell in 1980 and his most spectacular shunt of all, on the opening lap of the Monaco GP when he bacame airborne and landed right on his team-mate Jarier. On his better days, Derek came 4th in the Argentine and British GPs. His ride with March in 1981 yielded not a single point and his fortune with Theodore in 1982 looked equally dire until Carlos Reutemann suddenly quit and Derek was asked to take his place at Williams alongside Keke Rosberg. The Finn went on to win the title while the Irishman never made it to the podium, his best results being 5th in the US, British and Dutch GPs (although he would have won at Monaco here, had he not spun). Derek was very popular as well as a super race driver, but qualified poorly and therefore was prone to start-line collisions. Derek quit Formula 1 at the end of the season and raced Indy cars between 1983 and 1989. He badly smashed both legs in a shunt at Michigan in 1984 and his best Indy car result was 3rd at Milwaukee in 1987. He also raced Jaguar and IMSA Nissan sports cars from 1987 until retiring in 1992 and has since become a TV commentator in the USA. The FW07 replacement FW08 emerged at Zolder in 1982 as an ultra-short wheelbase, short chassis car (partly because a 6-wheel version was envisaged from the start following successful tests with a 6-wheel FW07D in 1981) designed around a weight-limit water tank with a short, tall fuel cell abaft the cockpit. From the back of the tub, it was virtually pure FW07, little changed from 1979. Two side pod profiles were used, one for faster circuits, one for slower. Later in the year, the wheelbase was lengthened 1.5" by raking the front suspension forward. Generally, the FW08 felt more at home on the faster circuits, and they reverted to short wheelbase form for the final GP at Las Vegas. The FW08 was the last Cosworth powered Williams and one of the least successful as well, winning only two GPs (one of them in "flat-bottom" 1983 form). Although Rosberg won the driver's championship, Williams placed only 4th in the Constructor's Cup behind Ferrari, McLaren and Renault - disappointing after two successive wins. FW08/1 was converted to 6 wheel form in Autumn 1982 using fixed length drive shafts as lower location members (a la Lotus 18, except 'upside down') to clean the airflow through the under-wing tunnels. It showed phenomenal straight line speed and 30% more downforce than the 4-wheeler. In fact the Williams lap simulator predicted a lap round Paul Ricard 6 seconds quicker than Arnoux's pole time of 1:34.4! Not surprisingly both 6-wheeled and 4WD cars were banned from F1 for 1983 (shades of the Brabham BT46B and Lotus 88! ).